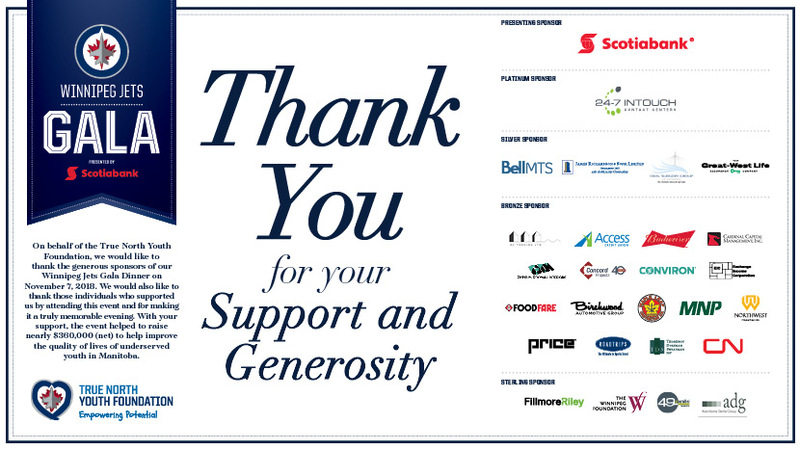 On behalf of the True North Youth Foundation, we would like to thank the generous sponsors of our Winnipeg Jets Gala Dinner on November 7, 2018. We would also like to thank those individuals who supported by attending the event and making it a truly memorable evening. With your support the event helped to raise nearly $360,000 (net) to help improve the quality of lives for underserved youth in Manitoba. Watch moments from the 2018 Winnipeg Jets Gala Dinner in support of the True North Youth Foundation.